Tomorrow [1 November 2017] is All Saints’ Day in the Calendar of the Church, and there is a provision in the Calendar and Directory of the Church of Ireland that allows the readings, collects and post-communion prayer for All Saints’ Day as option uses next Sunday [5 November 2017]. 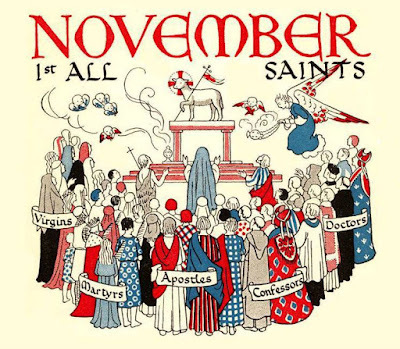 All Saints’ Day is celebrated on either 1 November or the Sunday falling between 30 October and 5 November; if the latter there may be a secondary celebration on 1 November. For those who are celebrating next Sunday as the Fourth Sunday before Advent, there are resources at this link. This posting is to help those who are marking All Saints’ Day either tomorrow or next Sunday. The readings for All Saints’ Day this year are Jeremiah 31: 31-34; Psalm 34; 1-10; Revelation 7: 9-17; and Matthew 5: 1-12. The readings may be found at this link: here. All Saints’ Day is one of the 12 Principal Feasts of the Church. From the third century there is evidence of celebrations of All Martyrs. The East continues a fourth century tradition of the ‘Sunday of All Saints’ being celebrated on the Sunday after Pentecost. East Syrians celebrate this on the Friday of Easter Week. In the early seventh century, the Pantheon in Rome, which had been closed for over a century, was dedicated to Saint Mary and All Martyrs. 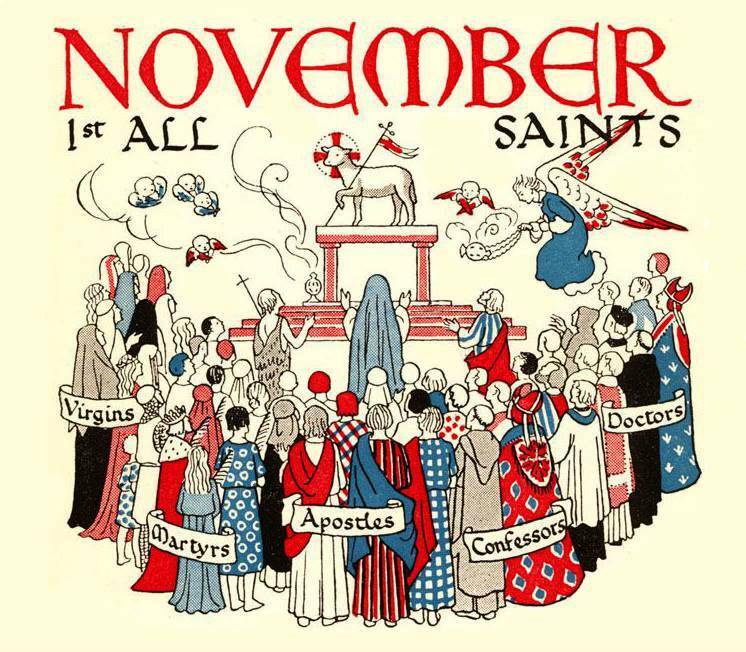 By the eighth century, 1 November was growing in popularity for the celebration of All Saints, possibly originating in Ireland. By the ninth century, the date had reached Rome and then the Holy Roman Empire. This Gospel reading (Matthew 5: 1-12) is the most familiar account of the Beatitudes. The Beatitudes are familiar to us all, perhaps to the point that we find it difficult to read them afresh and to find new insights when it comes to preaching on them. The Beatitudes will be familiar to many people who here them in church too – perhaps even to the point of familiar irreverence arising from Monty Python’s The Life of Brian. 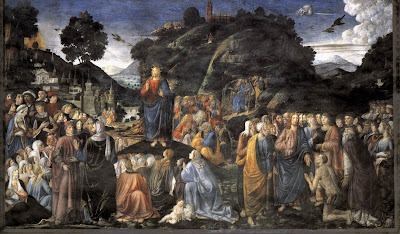 The Beatitudes are culturally embedded in our society, in our literature, in our arts. But how do we apply the Beatitudes to our own lives? How do we present them afresh? 12 χαίρετε καὶ ἀγαλλιᾶσθε, ὅτι ὁ μισθὸς ὑμῶν πολὺς ἐν τοῖς οὐρανοῖς: οὕτως γὰρ ἐδίωξαν τοὺς προφήτας τοὺς πρὸ ὑμῶν. ‘Blessed are you when people revile you and persecute you and utter all kinds of evil against you falsely on my account. In the Sermon on the Mount in Chapters 5 to 7, Saint Matthew presents us with a covenant renewal document. About half of this material is also found in Saint Luke’s Gospel, but considerably less of it may be found in Saint Mark’s Gospel. Some of the material is identical to the other synoptic gospels, some is similar. The Beatitudes are a declaration of the happy or fortunate state of the children of God who possesses particular qualities, and who, because of them, will inherit divine blessings. It is interesting to compare the delivery of the Beatitudes to the delivery of the Ten Commandments. Here we have the renewal of the covenant, and a restatement, a re-presentation, of who the Children of God are. Just as we sometimes find the Ten Commandments grouped into two sets, so we might see the Beatitudes set out in two groups of four, the first four being inward looking, the second four being outward looking. We might see the first four Beatitudes as addressing attitudes, while the second four deal with resulting actions. Are they ethical requirements for the present? Or they eschatological blessings for the future? Or are they are statements of present fact, identifying the qualities of a child of God and the consequent blessings that follow? Few among us, I imagine, are ever going to commit murder. But we all get ‘angry with a brother’ … sooner or later. The Sermon on the Mount exposes our own present reality in a very stark and real way, and the Beatitudes are a core text for Dietrich Bonhoeffer in The Cost of Discipleship and in the writings of towering Christian figures such as Dorothy Day, Thomas Merton, and Oscar Romero. Father Brian D’Arcy some years ago quipped in a radio interview how Dorothy Day once spoke of how her fellow Roman Catholics went to confession regularly and confessed to ‘breaking’ one of the Ten Commandments, but she wondered how often they confessed to ‘breaking’ one of the Eight Beatitudes. The scene opens with Jesus leaving the crowds and climbing up the mountain, like Moses in the Book Exodus leaving the crowd behind him, and climbing Mount Sinai. Mountains are so important in so many Biblical stories – Mount Sinai, Mount Zion, Mount Tabor, the Mountain of the Transfiguration, the Mount of Calvary outside the city, the Mountain of the Ascension. They provide dramatic settings for covenantal encounters with the Living God. Τὸ ὄρος (to oros) ‘a mountainside’ – the hill, or the mountain. The use of the definite article may indicate a particular hill or mountain. Today, in modern Greek, to oros or to ayios oros, the Holy Mountain, refers exclusively to Mount Athos. In those days, would this have prompted the first readers to make immediate associations with the holy mountain, the mountain of the covenant, Mount Sinai? Καθίσαντος (kathísantos), ‘sat down’ – sitting down. He went up, he sat down. In those days and in that tradition, a teacher sat down to teach. But there is a potential for double meaning or hidden understandings here, for the Greek verb is also used to set, to appoint, or to confer a kingdom on someone. So the new kingdom is being ushered in, Christ is sitting on his throne, his teachings are about kingdom values. Οἱ μαθηταὶ (oi mathetai: ‘the disciples’ – are the beatitudes for the disciples? Are they the ‘poor in spirit,’ those who mourn … and so on? Are they for the crowd below? The text is not that specific. Προσῆλθαν (proselthan (προσέρχομαι, prosérchomai), ‘came,’ came, to, approached, draw near. The disciples gathered around Jesus to hear his teaching. Μακάριοι (Makárioi): Does this mean ‘blessed’? Many people may remember Archbishop Makarios, the President of Cyprus who was deposed in a coup that was followed by the Turkish invasion of the island in 1974. ‘His Beatitude’ is a term of respect for metropolitans in the Russian Orthodox Church. The word ‘blessed’ is not the best translation for μακάριος (makários). ‘Fortunate,’ ‘well off,’ or ‘happy’ might fit better. Christ is telling those who hear him that they are fortunate to be this way. They are fortunate to possess these qualities of life. Why? Because it means they inherit the blessings or fortunes of God’s promised kingdom. Οἱ πτωχοὶ (oi ptochoi), ‘the poor’ – those in total poverty, possessing nothing and with no means to earn a living other than by receiving alms. ὅτι (oti): ‘for,’ ‘that,’ ‘because,’ or ‘since.’ This conjunction is used throughout the beatitudes. Αὐτῶν ἐστιν (afton estin, ‘theirs is’ as a consequence, not as reward. In other words, those who are dependent on God possess the riches of his kingdom. Οἱ πενθοῦντες (oi penthountes): ‘those who mourn,’ the ones who are mourning. Is this describing those who mourn for events in their own lives, or those who mourn because of their needs before God, those who are broken before God? They will be comforted, consoled, encouraged by consolation – αὐτοὶ παρακληθήσονται (aftoi paraklethésontai) – they will be comforted. Note the resonances with the word Paraclete for the Holy Spirit as the comforter. Οἱ πραεῖς (oi praeis), ‘the meek,’ the humble, the gentle, the self-effacing, those of mild of disposition or gentle spirit, perhaps those who do not make great demands on God, but submit to the will of God. ὅτι αὐτοὶ κληρονομήσουσιν τὴν γῆν (oti aftoi kleronomésousin tin gen): ‘for they will inherit the earth.’ They shall receive it by lot. They shall possess it. This is soon followed by the political activist and terrorist leader, Reg, saying: ‘What Jesus blatantly fails to appreciate is that it’s the meek who are the problem.’ This perfectly sums up the quickly growing annoyance of the violent with the peaceful attitude of Christ. Οἱ πεινῶντες (oi peinontes) – ‘those who hunger,’ those who are hungering. Τὴν δικαιοσύνην (tin dikaiosúnin), ‘for righteousness,’ for justice, for God’s justice. Many scholars who argue that Saint Matthew never really addresses the Pauline concepts of justification which is grounded on the faithfulness of Christ appropriated through faith. In the Sermon on the Mount, Christ introduces us to a righteousness that is apart from obedience to the law. The Sinai covenant too demanded a righteousness that exceeds that of the Scribes and the Pharisees, a righteousness that relates to the values of the Kingdom. Οἱ ἐλεήμονες (oi eleímones), ‘the merciful.’ The quality of mercy is not strained, and the quality of mercy is illustrated later in the Sermon on the Mount, in the Lord’s Prayer, when we are reminded to pray that we are forgiven as we forgive others. However, we not being told here that those who show mercy will have mercy shown to them. The fortunate, the blessed, those to be congratulated, those who should be happy, are those who have experienced God’s mercy, and as a consequence, find themselves merciful toward others. These people know God’s mercy. I can never be perfect in showing mercy or forgiveness; what little I show can only illustrate, be a sign of, point towards, be a sacrament of the mecy shown by God in the Kingdom. Οἱ καθαροὶ τῇ καρδίᾳ (oi katharoi ti kardía), ‘the pure in heart.’ The desire to touch the divine probably best describes this quality. Those who possess it will ‘be like him,’ and ὅτι αὐτοὶ τὸν θεὸν ὄψονται (oti aftoi ton Theo opsontai) and ‘see God,’ they will find themselves in God’s presence. Οἱ εἰρηνοποιοί (oi eirenopoioí), the reconcilers, those who make peace between warring sides. This is one and only use of this phrase in the New Testament. How unique and unusual a beatitude, yet, while it leaps off the pages, we try so often to scale down, to water down, its significance and its demands. Christ is not talking about those who seek or wish for peace, but those who make peace. What is the difference between a peacemaker and a conflict-resolution counsellor? When there are two conflicting demands, have they got to be given equal weight or respect? How do you make peace between the oppressor and the oppressed? Are there times when the demands for justice demand to be heard despite those who want a ‘bit of peace and quiet”’? ὅτι αὐτοὶ υἱοὶ θεοῦ κληθήσονται (oti aftoi uioi Theou klethísontai) – for they shall be called the sons of God, the children of God, those generated by God. If we are clones of God, then we act like God. And if we act like God, others may see what God is like, and may answer the invitation to be members of God’s family. ἕνεκεν (eneken), ‘because of,’ for the sake of. Μακάριοί ἐστε (makárioí este) – ‘Blessed, happy, fortunate are you.’ Did you notice the change here from the third person found in the previous verses to the second person in this final beatitude? ὀνειδίσωσιν (oneidísosin) – [whenever] people insult, reproach or upbraid you. Ψευδόμενοι (pseudómenoi – ‘falsely,’ under false pretensions, lying. The Greek word here, ψευδόμενοι, is not found in many of the early manuscripts. It may have been added in the process of redaction to reinforce the evil nature of the slander. Although when I am insulted as Christian, it often matters little whether I am being insulted for the sake of insult, or I am being insulted falsely. ἕνεκεν ἐμοῦ (eneken emou) – because of, or for the sake of me; in other words, because of, or for the sake of Christ. Possibly because of their testimony to Christ, but – probably better said as: because of their identification with Christ. Χαίρετε καὶ ἀγαλλιᾶσθε (Chaírete kai agallasthe) – ‘rejoice and be glad’; in fact, ‘rejoice and be exceedingly glad.’ Not merely you are blessed, but it’s also worth rejoicing and being glad, a pair introduced here, because we are going to be given two good reasons for such a joyous response. The first because is: ὁ μισθὸς ὑμῶν πολὺς ἐν τοῖς οὐρανοῖς (ho misthos hymon polis en tois ouranois), the reward, the payment, the wage for you is great in the heavens. Present suffering is going to give way to something in the future that is exceptionally rewarding. So, we can look forward to being in good company. The Beatitudes are culturally embedded in our society, in our literature, in our arts. Writing on the Financial pages of The Guardian some years ago [17 January 2011], Terry Macalister wrote: ‘From Tolstoy to Dostoevsky to Chekov, if anyone can tell a good story it’s the Russians.’ Well, in Chapter 2 of Boris Pasternak’s great Russian novel Doctor Zhivago, Larissa Feodorovna Guishar, who ‘was not religious’ and “did not believe in ritual,” was startled by the Beatitudes, for she thought they were about herself. How do we apply the Beatitudes to our own lives? Church Hymnal, 459: One of the great hymns celebrating this day is ‘For all the saints, who from their labours rest,’ which was written by Bishop William Walsham How (1823-1897) as a processional hymn for All Saints’ Day. The saints recalled in this hymn are ordinary people in their weaknesses and their failings. In its original form, it had 11 verses, although three are omitted from most versions – the verses extolling ‘the glorious company of the Apostles,’ ‘the godly fellowship of the prophets’ and ‘the noble army of martyrs’ were inspired by the 1662 Book of Common Prayer version of the canticle Te Deum. The tune Sine Nomine (‘Without Name,’ referring to the great multitude of unknown saints) was written for this hymn by Ralph Vaughan Williams (1872-1958) while he was editing the English Hymnal (1906) with Percy Dearmer. When he wrote this hymn, Walsh How was Rector of Whittington, Shropshire. At the time, this was part of the Diocese of St Asaph, but following the disestablishment of the Church in Wales in 1920, the parish was transferred to the Diocese of Lichfield in the Church of England. He became a canon St Asaph Cathedral, and spent time in Rome as chaplain of the Anglican Church there, All Saints’ Church, before returning to England. While he was Bishop of Bedford, Walsham How became known as ‘the poor man’s bishop.’ He became the first Bishop of Wakefield, and died in Leenane, Co Mayo, in 1897 while he was on holiday in Dulough. The hymn vibrates with images from the Book of Revelation. The saints recalled by ‘the poor man’s bishop’ in this hymn are ordinary people who, in spite of their weaknesses and their failings, are able to respond in faith to Christ’s call to service and love, and who have endured the battle against the powers of evil and darkness. In its original form, this hymn had 11 verses, although three are omitted from most versions: the verses extolling ‘the glorious company of the Apostles,’ ‘the godly fellowship of the prophets’ and ‘the noble army of martyrs’ were inspired by the 1662 Book of Common Prayer version of the canticle Te Deum. Church Hymnal, 464: ‘God, whose city’s sure foundation’ was written by Cyril A. Allington (1872-1955), a former headmaster of Eton, while he was Dean of Durham for a service of the Friends of Durham Cathedral. The hymn is generally sung to the majestic tune ‘Westminster Abbey’ by Henry Purcell (ca 1659-1695), the first official Organist of Westminster Abbey. Until the arrival of Edward Elgar, he was regarded as the greatest English composer. Thanks & Praise, 23: ‘Christ is surely coming, bringing his reward’ () is by the Revd Christopher Idle, who has written hundreds of hymns and now lives in retirement in Bromley. The tune ‘Land of hope and glory’ is by Sir Edward Elgar (1857-1934) and is arranged by Derek Verso. Thanks & Praise, 43: ‘God everlasting, wonderful and holy’ is by Harold Riley (1903-2003). The tune Coelites plaudant is a melody from the Rouen Antiphoner (1728) that was harmonised by Ralph Vaughan Williams (1872-1958), originally for ‘Christ, the Fair Glory of the Holy Angels’ by Athelstan Riley in the English Hymnal, co-edited by Vaughan Williams and Percy Dearmer. Give us grace to follow their example and continue their work. giving thanks for their lives and example and for all that they have meant to us. for the hungry, the sick, the victims of violence and persecution. and for all who nurture and encourage faith.